Be the first to share your favorite memory, photo or story of Doranna. This memorial page is dedicated for family, friends and future generations to celebrate the life of their loved one. 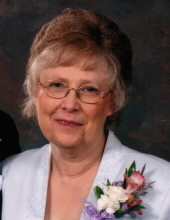 Doranna Virginia (Kelley) Berry peacefully passed into her heavenly father’s hands on October 30, 2018 surrounded in her home by her loved ones at the age of 69. Doranna is survived by her husband Joel T. Berry, her children Scott (Ashley Bunch) Berry of Wooster, and Christina (Paul) Martin of Findlay as well as grandchildren Lucas and Elena Martin, and many beloved family members. She was preceded in death by her mother, Dorothy (Prost) Kelley and Father Sanford Jack Kelley. Doranna was born August 24, 1949 in Columbus, Ohio and was adopted at birth by her mother and father. She attended Upper Arlington High School and graduated from the Ohio State University in 1971 with a degree in early Childhood Education. While in college, Doranna was a member of the Alpha Delta Pi sorority and an avid football fan. After graduation, Doranna was employed as a teacher in Coshocton and West Holmes school districts. Doranna met her husband, Joel, when they both ventured to the 60th Rose Bowl in 1974 and were married in Columbus, Ohio on December 27, 1975. After their union, they built a house on the Berry family farm located just north of Shreve where they welcomed and raised their two children. Doranna was a loving mother that much of her time volunteering at the school and baking intricate birthday cakes and pies. Joel and Doranna were co-owners of the Twinsberry Tree Farm and active in the Ohio Christmas Tree Association. Later in life, throughout her extended battle with Parkinson’s, Doranna was a loving and caring grandmother that enjoyed reading and spending time with her two young grandchildren. Friends and family are invited to call at Schlabach Funeral Home in Shreve, Ohio on Friday November 2nd from 5:30 to 8:00 p.m. A memorial service will be held at the Shreve Christian Church, where Doranna was an active member, on Saturday November 3rd at 11:00 a.m. with graveside services and fellowship meal to follow. All are welcome to attend and celebrate Doranna’s life with the family. Memorial contributions can be made to the Michael J Fox Foundation for Parkinson’s Research, Hospice of Wayne County or Shreve Christian Church. The family would like to thank Hospice and Home Instead for all their support and loving care. To send flowers or a remembrance gift to the family of Doranna V. Berry, please visit our Tribute Store. "Email Address" would like to share the life celebration of Doranna V. Berry. Click on the "link" to go to share a favorite memory or leave a condolence message for the family.